Those familiar with my work know that the family dogs have played a big role in my writing because of their enormously big role in our lives. A few years ago, I went into the Record’s archives and found that I’d written nearly 50 dog columns over the course of two decades. I was both surprised and gratified to see that I hadn’t been too repetitive in the stories I told about dogs. 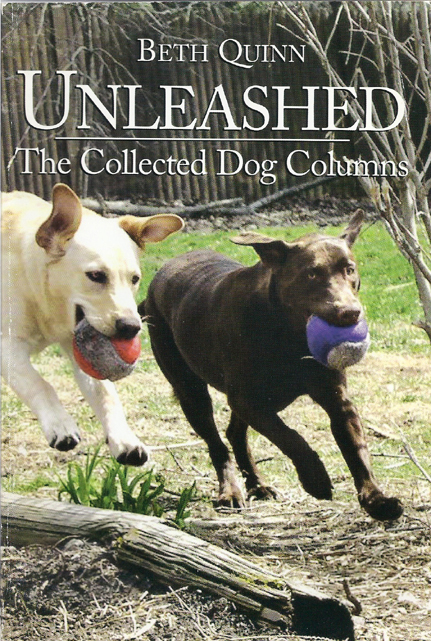 Those columns eventually found their way into a book of their own, titled Unleashed. The column below was written after the book was published. To this day, even when I don’t have a platform for publication, I continue to write about Tom and Huck and Scout and Molly and Riley and … well, you get the idea. With the arrival of grandchildren, one tumbling into life after another now, the dogs in our family have had to trade in their erstwhile peaceful existence for one fraught with excitement and some danger. None of the children actually means to cause a dog any harm, with the possible exception of our 2-year-old granddaughter Devon, whom I recently caught standing face to face with Tom, our yellow Lab. She had his lips gripped firmly in her little hands, and she was twisting them backwards, causing Tom to have a most peculiar and unnatural smile on his face. Tom rolled his eyes toward me in a mute plea for help. He dared not move a muscle lest she tighten her lip grip. I saved him from the enfant terrible, and he will forever love me for my intervention – and for the time-out Devon had to serve in hopes that she will reform. That Tom, he’s a good dog. All the Labs in our extended family are – Tom and Huckleberry, Gus and Little Mac. Not one of them would harm a child no matter what body part that child poked or prodded or twisted. Soon after the lip-gripping incident, I watched the care Tom took with Devon when she climbed onto his back to play horsey. Tom slowly lowered himself to the floor, then gently rolled over onto his side to unseat her. But the dogs also manage to inflict punishments of their own, though I’m certain they don’t mean to. Huck’s tail, after all, is just the height of a toddler’s eyes, and there’s no managing the thing once it’s revved up to full wag speed. Devon has developed a defensive blink when she’s in the same room with a dog. Her older cousin Sam did, too, during his own toddlerhood. Now Sam has twin baby brothers, and the wagging Lab tails have created a problem of a different sort. The babies were premature, weighing in at 1 pound and change, each barely bigger than an ear of corn. They had to finish cooking at the hospital, and when they were finally sent home, they arrived with oxygen tanks and monitors and tubes and wires. My son’s house looked like a nearby hospital exploded and rained durable medical supplies into their living room. The Labs went into nanny mode when the babies got home. There isn’t a Lab on this earth who doesn’t get involved when a baby is in the house. Sit down with a twin and a bottle, and there was Gus on the couch next to you, resting his chin on your shoulder to supervise the meal. I’m sure Gus would have reminded me to burp a baby if I forgot to. And Little Mac. Well, the very prospect of a lickable baby in the house – two lickable babies! – brought out the whirling dervish in him and set his tail wagging faster than you could see it moving. It practically hummed. Therein lay the problem, of course, when there were wires all over the place connecting two babies to oxygen and monitors. After Little Mac had been through the room, it wasn’t uncommon to discover a wire just dangling there, just hanging from a twin, unmoored from an oxygen tank by the swipe of a dog tail. Oh my, we would say when someone discovered an unattached wire. Who’s not getting oxygen? Is there a twin turning blue in here? Fortunately, neither Austin nor Bryce ever turned blue and, really, they didn’t seem to need the oxygen all that much. Still, Little Mac got a time-out of his own whenever this happened, banished to the yard to wear out his exuberance by chasing a squirrel or two. And while a Lab never pouts while serving his time, I’m certain that, on some level, he was “thorry,” too. Note: Austin and Bryce are now very healthy two-year-olds. Gus, my son’s yellow Lab, died of old age a year ago. A new yellow Lab puppy in their family, Ben, conspires with the boys to create havoc at every opportunity. If you’ve written your memoirs, a family history or a work of fiction, why leave it sitting in your computer, notebook or shoe box when it can be turned into a book? -- Copy edit your story to ensure that it’s error-free. -- Design and lay out your book, adding photos or any other material you'd like to include. -- Get it into print through createspace.com, Amazon's self-publishing service. -- Make it available for sale on Amazon.com. -- If your child has a book that involves his or her own drawings and a story to go with them, I can help get that into book form, too. What a great present for family members! See Don't You Roll Your Eyes at Me! and When Daddy Goes Away on the samples page. -- I don’t make changes to your manuscript without your consent. I work WITH you, not in place of you. You sign off on editing changes at several points in the process. -- I don’t do the writing for you. I’m not a biographer or ghost writer. I’m here to help you get YOUR work into book form. Cost determined by the extent of work requested and agreed upon in advance. Every writer needs an editor. turn your story into a book.